Spilled gasoline should be wiped off immediately. Take out the fuel tank prop stay (1). Disconnect the fuel pump lead wire coupler (2). Place a rag under the fuel feed hose (3) and disconnect the fuel feed hose from the fuel tank. when removing the fuel tank, do not leave the fuel feed hose on the fuel pump side. 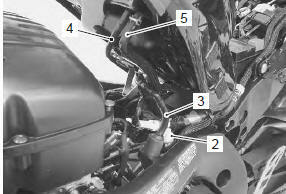 Disconnect the fuel tank drain hose (4). Remove the fuel tank by removing its bracket bolt (6). Install the fuel tank in the reverse order of removal. 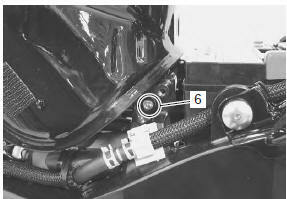 connect the fuel feed hose to the fuel pump until it locks securely (a click is heard).